Winter is approaching and the bitter cold will be here before we know it. 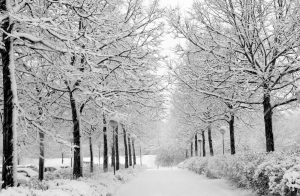 Winterizing your home has many benefits and will save you money in the long run. Fall is an excellent time to get prepared and make repairs before the big storms hit. Here are a few simple, low cost tips that will protect your home from the elements. 1. Keep the drafts out! An easy and cost efficient fix is a draft snake or stopper! 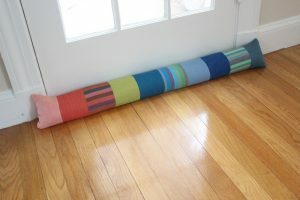 You can purchase them or easily make one yourself out of a rolled up towel or fabric filled with sand. All you have to do is slide that under the door and the draft will disappear. Pre-made draft stoppers can be purchased for as low as $5.00. Now that’s a cheap way to keep your heating bill down! Don’t let those little cracks and holes let the bitter cold in! Simply get some caulk and seal them. Al ways check the windows, doors and walls for any holes. If you can feel a breeze then it is time to get them sealed! 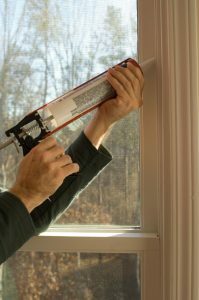 Caulk can be purchased for as low as $4.00! Come on, you can’t beat that over an outrageous energy bill! Everyone wants a warm home during the the winter, but do you really need the heat blasting all of the time? 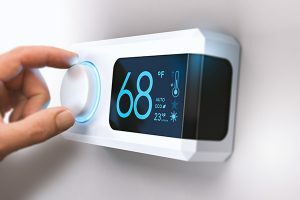 When you’re not at home during the day and sleeping during the night, keep your thermostat programmed to a cooler temperature and you will also save money that way. And the nice thing is, it’s free to make this change! If you have an older thermostat, think about upgrading to a new one. There are some pretty cool smart thermostats out there. Some can even be controlled with your phone when you are not even home. Awesome right! 4. 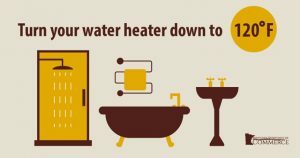 How about turning down your water heater in the winter! Most people don’t even think about lowering it or that it can save you money. Most times you have it set on a default setting and nev er think twice about it. Try setting it to 120 degrees and see if your bill is slightly lower. Now, the easiest of all! Change those furnace filters! It is so easy to forget yet it is so important to change or clean them regularly. 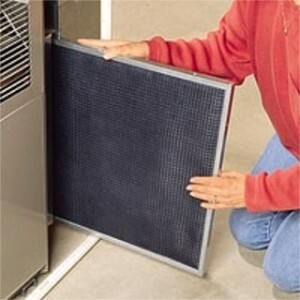 Filters that are dirty and old restrict air flow and in return increase your energy demand. There also is the option to switch to a permanent filter if that will be less stress to worry about. 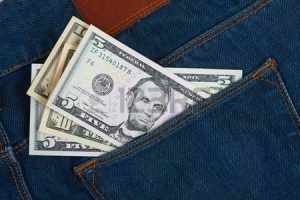 At the end of the day, these are simple and relatively inexpensive tasks to upkeep your home and they don’t take much time at all. Remembering these small things will keep your home cozy and your pockets happy. PreviousWhat does having a new home mean to you? NextNow is the time to enjoy this beautiful place we call home! Now is the time to enjoy this beautiful place we call home!